One of the best moments in working on beautiful illustrated books is when you see the final product. When you’re an editor and/or proofreader, you only see the project at certain stages. You can visualise the final book in your imagination, but even when you’ve worked on the proofs it’s a fantastic surprise actually seeing the published book itself. I’m always in awe of the work of the writer(s), designer, photographer and others, and grateful to have been a part of that team. And I give thanks to the publishing gods that people continue to collaborate and make big, sumptuous books! 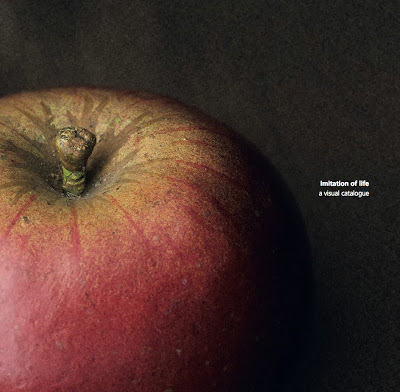 Imitation of life – a visual catalogue is one of those projects. This book is seriously breathtaking. It still amazes me when I look at it, months after it was published. 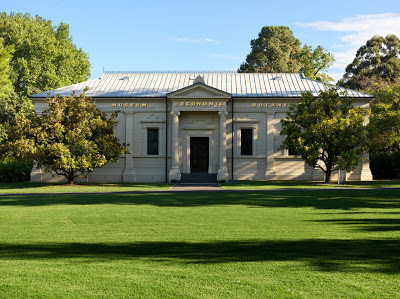 It’s a substantial hardback catalogue – a true visual feast – and won a 2014 MAPDA (Museums Australia Multimedia and Publication Design Awards) Award. Imitation of life presents one of the Santos Museum of Economic Botany’s most surprising collections: a 19th-century ‘pomological cabinet’ of 360 papier-mâché fruit models, made by Heinrich Arnoldi & Co in Germany. There are 192 apples, 129 pears, 35 plums, three peaches … and one apricot! 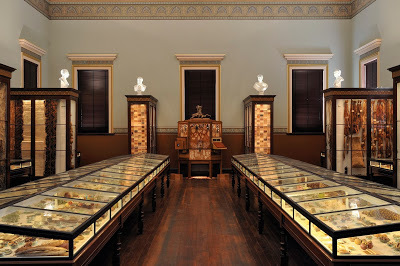 It tells the story of how these rare fruit model collections (or cabinets) were amassed by European pomologists and other experts throughout the 19th century; and how one such collection came to be in the Santos Museum of Economic Botany. Each of these beautiful models was made over a two-year period. 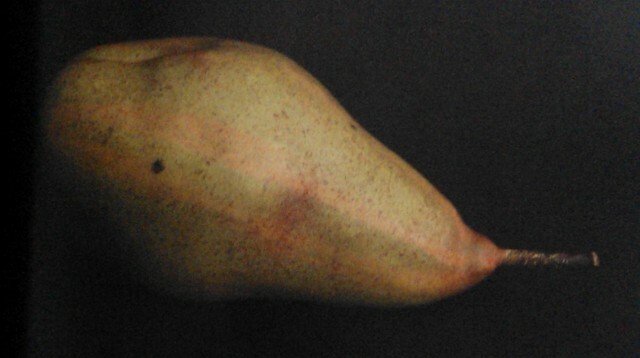 In the first year, the fruit would be modeled from life, and the papier-mâché model produced. 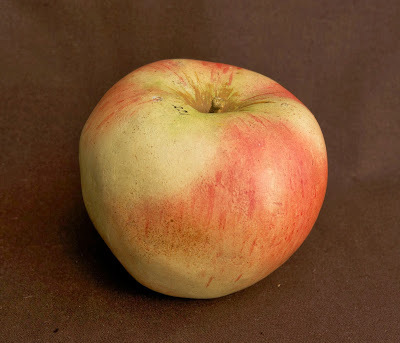 In the second year, the model would be painted, again from life, copying a similar apple, pear or stone fruit in that year’s harvest. 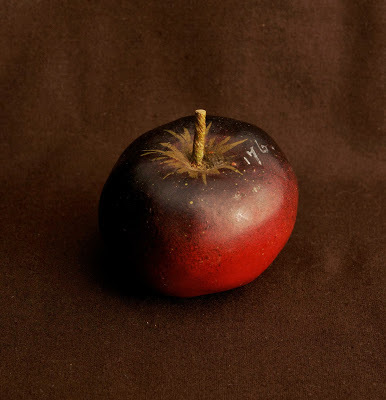 In those long-ago times before photography and online learning, wax, porcelain and papier-mâché fruit models were used in universities to educate pomologists and other scientists. The models – a gorgeous mix of science and art – were also collected on subscription by serious art and natural history collectors. 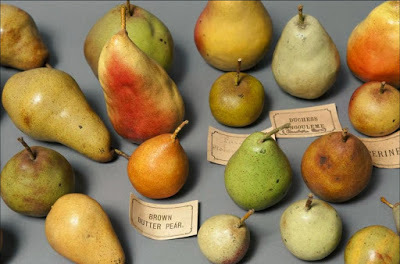 Many of the fruit varieties in the Santos Museum collection are lost to the world now. But curiously, they seem as alive in Imitation of life as the fresh apples, bananas and lemons now in my kitchen fruit bowl! And I’m not alone in this – visitors to the Santos Museum also sometimes mistake the models for real fruit. So are these models simply reminders of long-gone apple, pear and stone fruit varieties, destined never to be tasted again? Or are they fruits forever ripening in our imaginations, because we’ve now seen their vivid replicas? For me, it’s the second option. 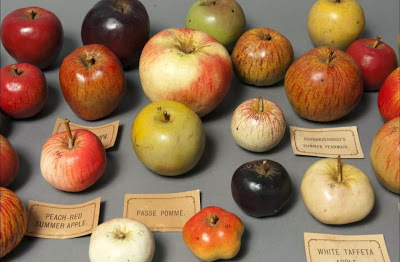 When I look at these fruit varieties that no longer exist, my imagination zooms back to the orchard in which they grew. The worker who plucked a pear is there, as is the cook peeling an apple for a pie, or a diner slicing a peach before sharing it and eating a portion. Were these fruits expensive treats? Or did people grow some varieties in their own gardens? Did some varieties grow wild? Work, kitchen and dinner table conversations from well over a century ago spring alive again. What did these apples and pears taste like? Were they sweet, juicy, floury, crunchy, nourishing? Did they smell delicious? That lone apricot might have tasted a little woody or tart. 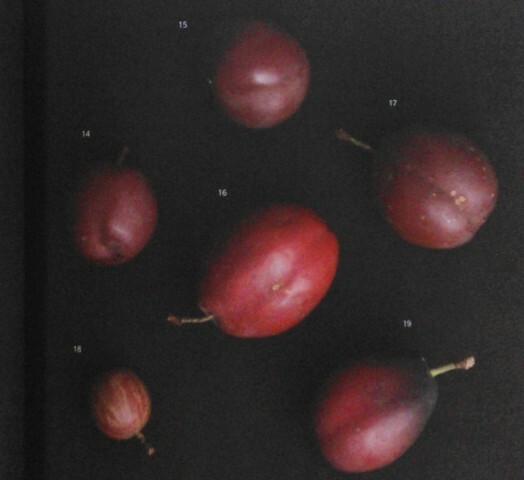 And the plums look like they could have had a concentrated sweetness. What do you think? Without a doubt, the museum’s pomological cabinet, and this book, keep their very essence alive. Imitation of life gives each apple and pear its own page, and reproduces the models much larger than their original size (apples at 200%, other fruit at 150%). It’s dramatic and engaging, and makes you want to linger on every page. 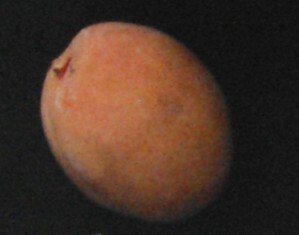 The apples, pears, peaches, plums and apricot are photographed against a black background. Each model seems to loom out of the dark, freed from the past and now alive again, here in the present. The darkness also calls to mind a place for storing ripening fruit. Or these models might’ve escaped from a 17th-century Dutch still life, painted centuries before they were even made. ‘Time passes, but the past, present and future are always here,’ they seem to say. Another lovely thing about these models is that none of the fruit they represent is perfect. Apples are not perfectly round, a pear has a blemish. A lot of the models have had a number written on them. The imperfection of nature and life represented by these ‘imitations’ is, for me, what makes them seem so fresh and real. No discussion that includes 192 apples is complete without mentioning some famous apples (and those who encountered them). These stories are ingrained in our imaginations. Many hail from the worlds in which these fruits were grown and models made. 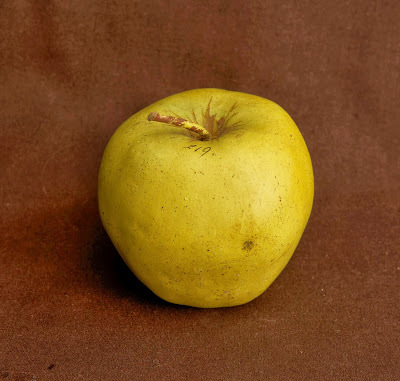 So, was this yellow beauty like the apple that William Tell split in two with his arrow, saving his son’s life? 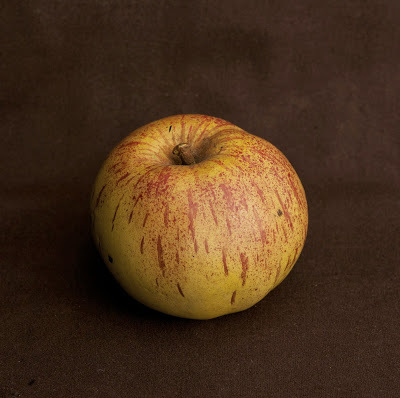 Or was this the humble apple variety that caught Sir Isaac Newton’s eye, leading him to identify gravity? 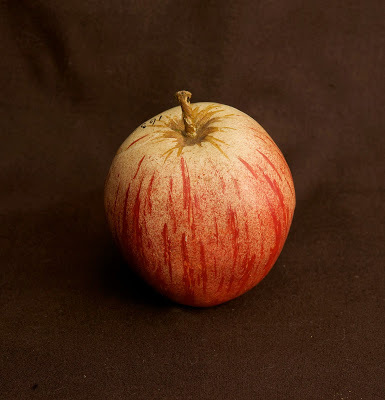 Was it a dark-red apple like this that Snow White bit into, making her fall into a drugged sleep? And of course, there’s the most famous apple-eater of all: Eve, in the garden of Eden. Here’s a fabulous poem about Eve by Australian poet, Kate Llewellyn. I love this poem for its wit, and for how it turns the story of Eve completely on its head. I’ve never come across a take on Eden as fresh and memorable as this. I don’t read many blogs but just wondering what you were doing came upon this. Just lovely and a fantastic collection. Thanks for sharing this. Hello dear Jane, thank you so much, really glad you enjoyed it. Your comments really mean a lot to me, thank you! Absolutley love this Theresa – the museum, the exhibits, the book and the word (‘pomological’ – who knew? well, not me). Thank you! No worries, glad you enjoyed it dear Sue!